Rolling off the track Sunday afternoon, Yeley and the Accell Construction Chevy SS were ready to go. He began his climb to the front, avoiding single car cautions, and making a steady gain in positions. However, on Lap 145, bad luck struck, and the drive shaft broke. Pulling the car into the garage the team went to work swapping out parts to try and get the car back out onto the track. With 51 laps down, Yeley returned to the race, and managed to finish the race in 35th. (Fort Worth, TX) - JJ Yeley's weekend to Wild Asphalt Circus started out on Friday morning at Texas Motor Speedway, when the crew unloaded the No. 36 Accell Construction Chevy SS. Immediately the crew went to work getting the prepared for a full weekend of racing. Qualifying 36th, Yeley's crew went to work making adjustments to the car, getting ready for some night racing. Coming into the weekend with an Earnhardt Childress Racing (ECR) engine, the team had some power behind the wheel. From the drop of the green flag, the No. 36 Accell Construction Chevy was not handling as well as the team had wished. The car was loose coming off the turns, and caused Yeley to go laps down early on. Through pit strategy and several cautions, Yeley gained back some laps, and started to climb in the position. However, on lap 300, the right rear axle broke, leaving the team to be finished for the remainder of the race. Yeley ended the race in 39th position. "Tough break this weekend for the No. 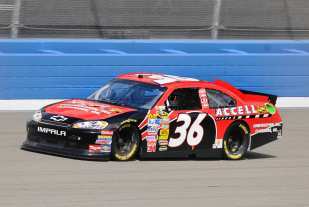 36 Accell Construction Chevy and Tommy Baldwin Racing," Yeley said. "We'll pack up and head back to the shop and get ready for Kansas, where we can hopefully pick up some positions in the points that we lost this weekend." 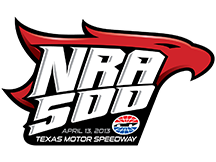 JJ Yeley finished the weekend at Texas Motor Speedway NRA 500 in 39th. He is currently 155 points behind leader Jimmie Johnson in the race for the Sprint Cup Championship. Next weekend the Tommy Baldwin Racing No. 36 Accell Construction Chevy heads to Kansas Motor Speedway. Accell Construction is running a limited Primary sponsorship with Yeley and Tommy Baldwin Racing. This is Accell's third race with TBR out of seven. Point Standing: 26th, 107 points behind Dale Earnhardt Jr.
JJ Yeley's weekend to the Golden State started off great, adding on an additional race with sponsor Accell Construction Inc. Prior to the weekend Yeley was still in search of sponsorship for the weekend, however, impressed with the team and driver, Accell added on early in the week. After arriving to the track, JJ Yeley and the No. 36 Accell Construction Chevy SS, got down to business with practice, followed by qualifying. Yeley came out of qualifying in 37th position. Knowing that clean air and great pit strategy was a must coming into Sunday, JJ and the TBR team had their work cut out for them. At the start of the Auto Club 400, Yeley battled the track conditions and working to dial in the handling of the No. 36 car. Going a lap down early in the race, the team fought to get back on the lead lap. After green flag pit stops, and several single car cautions, Yeley took the wave around on lap 121, with 79 laps to go. The No. 36 Accell Construction Chevy SS escaped the wild ending to the Auto Club 400, finishing 27th. Yeley's fight to the end paid off, moving him up one more position in the NASCAR Sprint Cup Championship standings to 26th. Crew Chief, Joe Lax, continued to give nothing but encouragement for the future. "Another tough break this weekend boys, but our hard work and determination will pay off. We may not have gotten the finish that we liked, but were moving up in the points standing. Good things are coming ahead." "I am so proud of my Accell Construction race team. It was a battle, Auto Club Speedway is a tough track but the Tommy Baldwin Racing team showed improvements and again... never gave up," Yeley said. "I am thankful for the off weekend and getting to spend the Easter weekend with my beautiful family but Martinsville can't come soon enough!" JJ Yeley finished the weekend at Auto Club Speedway's Auto Club 400 in 27th. He is currently 107 points behind leader Dale Earnhardt Jr in the race for the Sprint Cup Championship. In two weeks the entire Tommy Baldwin Racing Team is off to Martinsville, where "tempers fly" and "bumping and banging" are common scenes. Let's hope the fight to the finish pays off for the entire Tommy Baldwin Racing organization! Did you know? : Last week's "Bristol Shake" featured Yeley's wife and daughter, making it one of the Most Memorable Drive Introductions in NASCAR. In case you missed it, click here. Keep up with TBR: Keep up with the TBR team by following us on Twitter and Facebook. NASCAR Sprint Cup Series (NSCS) Crew Chief Tommy Baldwin formed Tommy Baldwin Racing (TBR) in 2009. Baldwin utilized a declining economy to open a NSCS team with a stringent budget. The team worked to build to full-time competition, and by the 2011 season, the team's third season, TBR competed in every race and locked the No. 36 Chevrolet in the top-35 in NSCS Owner Points. Dave Blaney drove the No. 36 Chevrolet to TBR's highest finish of third in the October 2011 event at Talladega Superspeedway. In 2012 both cars fielded by TBR finished in the top-35 in points. Based in Mooresville, N.C., TBR will compete in the NSCS in 2013 with NASCAR veteran Dave Blaney driving the No. 7 Chevy SS and JJ Yeley piloting the No. 36. "JJ felt bad about the speeding penalty, but we race as a team and understand that penalties happen," Lax said. "We made great strides during practice and the race and this week we're off to Bristol — one of JJ's favorite tracks." For more information on Accell Construction, please visit www.accellconstructioninc.com.